Development of a five-year business plan, purchase of state-of-the-art equipment, and reliance on a timetable that is dictated by Mother Nature – they’re not the usual concerns of a Pinkerton Academy junior. But it’s the way of life for Ryan Neal of Chester, who operates Ryan’s Sugar Shack, a thriving maple syrup business that he founded. Neal, 17, began tapping two maples in his backyard when he was 13 years old. Now in his fifth season, he taps about 1,200 trees at multiple locations in Chester, including both sugar and red maples. Neal said most maple syrup producers try to use sugar maples alone because they have a higher sugar content, but with 350 red maples on his family’s 6 acres, it’s worth it to tap them. He explained that it takes a lot more sap to get a gallon of syrup from red maples - 70 gallons of sap for one gallon of syrup, vs. 40 to 50 gallons of sap for 1 gallon of syrup with sugar maples. He expects to produce at least 300 gallons of syrup this year, the most he has produced thus far, and as of the end of February, he had already processed over 5,000 gallons of sap. Last year, he made about 60 gallons of syrup, and he’s surpassed that amount already, with about 100 gallons. His evaporator boils 150 gallons per hour. In spite of the growth of his production and business, Ryan’s Sugar Shack is still a one-man show. While February and March are the busiest times, he split and cut 12 cords of wood and bought 10 additional cords this summer to fuel his evaporator. He also collects sap via tubing, rather than having to physically empty a bucket on each tree, and manages to take on a few small tubing installation and repair jobs on the side. “I run everything myself,” he said, adding that he does all his own research as well. “I had a lawyer for the LLC (limited liability company) set-up of the business, but everything else I learned myself. “This year is a pretty big expansion, and I figured it all out myself,” he added. That expansion includes an iconic 16-by-24-foot sugarhouse, which holds a state-of-the-art 3-by-12-foot evaporator and lots of filtering and canning upgrades, as well as room for product storage. The sugarhouse allows him to boil the sap indoors for the first time, and inside the sugarhouse, the scent coming from the boiling is pure New England. In spite of the intensity of the winter work, Neal continues with his studies at Pinkerton. He’s involved with the school’s coop program in environmental studies, which allows him to leave school early this term so he can go home and run his business. He will receive environmental studies course credit for his business – “it’s essentially getting credit for practicing the class in a real-life setting,” Neal said. 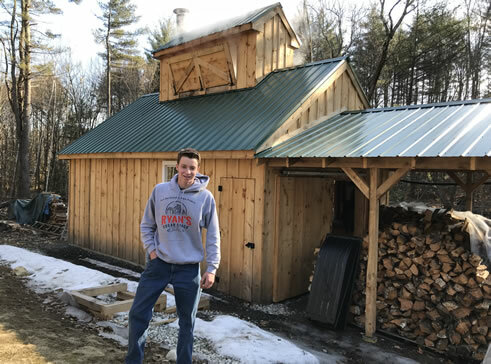 He also works with the instructor of the maple syrup production class at Pinkerton, and previously installed a new pan system for the Derry high school’s sugarhouse. While his first year of production was financed with a loan from his parents, Neal quickly repaid the money and runs the business on his own. “My parents support what I do and are always there to help, but I do everything myself and have learned everything on my own,” he said. His business looks nothing like it did when he started out. “In the third year, I put in my first tubing system,” he said of his sap collection. “Now everything is on tubing. I made a jump from the second to the third year to do a more modern system, and then changed to a more commercial way of doing things. Neal hopes to go on to college, but his plans will depend on this year’s maple syrup production. “I want to keep this going,” he said. “I’m hoping it’s a good year. Of course making maple syrup depends on the weather – warm days at least in the 40s and nights below freezing produce the best sap. Neal hopes the season will extend through the end of March or beginning of April, but he said it started very early this year. He started tapping his trees on Feb. 9, and in his conversations with other area producers, he was on the early side. And will the season end when the peepers come out? Neal said people go by a lot of different things to determine the end of the season, but once the temperatures stay above freezing for a few days and the trees start to bud, the sugaring season is over. “The sap changes and you can’t use it anymore for maple syrup,” he said. To contact Neal or purchase his syrup, visit: http://www.ryansugarshack.com or call 370-0077. For Maple Weekend this year, March 24 and 25, he will offer tours and his evaporator will be running. 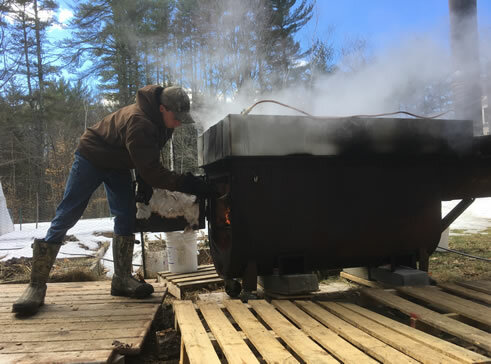 March is Maple Month in New Hampshire, and Ryan’s Sugar Shack at 118 Meadow Fox Lane in Chester will be open from noon to 4 p.m. daily. Although he’s just a sophomore in high school, Chester’s Ryan Neal is already a veteran maple syrup producer. And his is not just a hobby backyard operation with a few buckets, it’s a state-of-the-art production with about 250 taps in the woods behind his home and on a neighbor's land, and some pretty sophisticated pumps and lines. With a great, though early, start to the season last month, Neal is on track to have about 80 gallons of the pancake topper by the time the maples stop running. 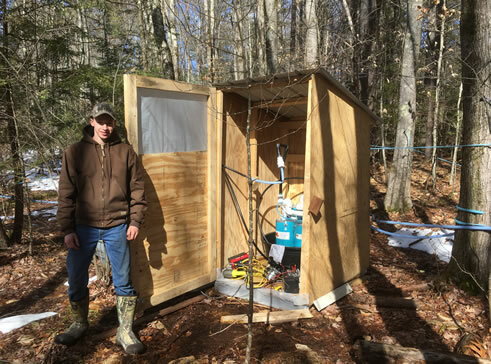 With an intricate maze of blue lines and a new vacuum pump set up in the woods behind his home, Neal was excited to say that he’s looking at pulling around 30 gallons of sap per tree this year. To put that into perspective, an old-fashioned tap and bucket would be closer to five gallons a season. "That was my big problem: Getting these trees to run enough. But this year it doesn’t look like that’s going to be a problem," said Neal. Neal started his maple sugaring when he was 13 years old and in seventh grade. It started out as a hobby after he and a friend got the syruping bug, but in short order he was improving his operation. This year he’s also got a new evaporator that boils down an impressive 22 gallons an hour. The furnace is a secondhand homemade boiler he found a great deal for on the internet, and he had a custom stainless steel pan made up by a welder. This is a great improvement from his previous cinderblock boiler, and he said he’s very pleased with the results. "This is way better than last year," he noted. Though it took a few boils to learn the ins and outs of this particular pan, the piece of equipment that allows the sap to burn off extra moisture and increase its sugar content, he was soon an expert on just when the sap was ready to pour off for finishing and bottling. In addition to the new evaporator and vacuum system to improve on how much sap he can pull, he’s also invested in a new pump to keep it all flowing smoothly from holding tank to holding tank. And Neal does this all while still getting his school work done. While the first couple weeks saw him getting little sleep, especially as a recently replaced pump needed constant maintenance, he got some help with the schedule last week as February vacation from Pinkerton Academy rolled around. 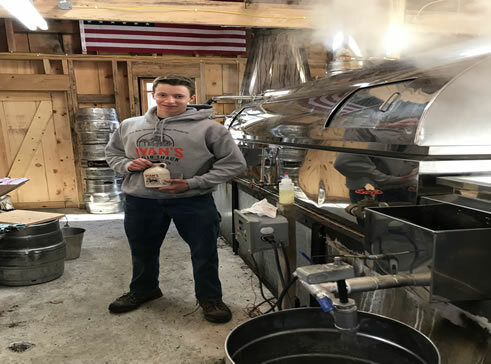 Ryan’s Sugar Shack has produced more syrup this year than in all of his previous years combined, something the producer said is owed to his new system. While he gets some help from his parents, it’s really a one-man show at this point. "I can’t really help anymore,' joked his mom, Wendy Neal, referencing the complicated nature of her son's operation. His parents have been instrumental in providing business loans for his work, however. But as with any bank, Neal has always had to justify the expenses and pay the loans back in a timely fashion. And that’s something he’s never had a problem with. The young producer is an avid researcher, both online and with the help of the more veteran producers in the state. He keeps up good lines of communication with his peers and after a short time of talking with him about his passion, it's clear he knows the material inside and out. And that’s not just about the science behind the trees. He’s also the designer, installer and troubleshooter of all of his equipment. He does his own electrical work and plumbing and is always looking for ways to improve his set-up. "There’s not a whole lot of small producers using this type of equipment, so I had to figure it all out," said Neal. "This is what your big producers are going to do." "I’ve definitely learned a lot through this whole thing. I've come out of this, at this point, with a lot more skills than I had to begin. Just a lot of research and a learning as you go kind of thing," said the young producer. But perhaps more important than the technical side is just how Neal's syrup tastes. "I like it the best out of everything I've ever produced," he said. While sugar maples are the powerhouse producers for the area, Neal makes his syrup with what he’s got on hand. It takes a little more time to boil down red maple sap, but the flavor is definitely on par with the sugars, he said. Neal boils 60 gallons of sap to make a gallon of syrup. While Neal has 200 or so red maples tapped out back, he’s supplementing that with some sugar maples on a neighbor’s property. "You can definitely taste the difference," said Neal, as he kept an eye on the evaporator turning more sap into syrup. 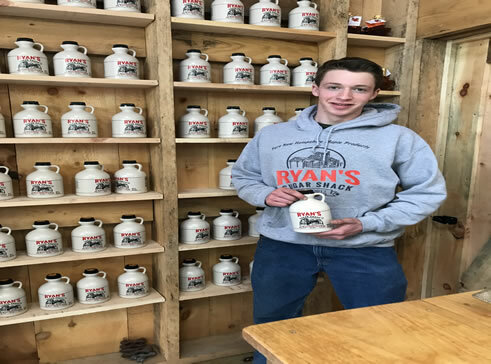 The best way to get some of Neal's syrup is to visit his family home at 118 Meadow Fox Lane in Chester or check out his website at: ryansugarshack.com for ordering. Email ryansugarshack@gmail.com with questions.